FPSB India has been organizing various theme-based seminars for bringing the stakeholders on a common platform. FPSB India organized the Second Financial Planning Congress 2007 along with the Indian Express Group. The theme of the Congress was ‘Economic & Financial Literacy: Seeking a blueprint of India’ which saw the participation of speakers from Ministry of Finance, Indian Financial Regulatory Space viz. SEBI, IRDA & PFRDA and the financial service industry. It also saw the participation of around 520 delegates from the Financial Service industry. In the Congress, Mr. M. Damodaran said that whoever regulates the Investment Advisors needs to look after the average investor, and the issuer & intermediaries will look after themselves and the focus should be to create financial literacy. He indicated that since products are getting complicated, India needs advisors who will demystify them and advise the consumers the right products, for the right reasons and convey the risks associated with the products.If that task is aided by FPSB India and it plays a role akin to that of a Self Regulatory Organization, nobody should have any reservations as well. In May 2006 FPSB India organized the first Financial Planning Congress based on the theme “Establishing a Consumer Centric Financial Services Delivery Infrastructure”. The Financial Planning Congress 2006 received a tremendous response and saw the participation of around 12 speakers and 500 delegates. Ms Usha Thorat, Deputy Governor, Reserve Bank of India also inaugurated an Approach paper on "Development of Professional Financial Advisory Model for Rural Population in India". Ms Usha Thorat congratulated on the role played by FPSB India and spelt out the measures that RBI is taking to make the Banking Services more oriented towards the consumer. In January 2006 FPSB India organized the first Regional Financial Planning Symposium based on the theme “Financial Planning for the Masses: Opportunities & Challenges”. The Symposium saw the participation of more than 180 delegates & 15 thought leaders in the Industry sharing their views and experience with the delegates. It was graced by the presence of Mr. D. Swarup, Chairman, Pension Fund Regulatory and Development Authority, who expressed that Financial Planners & FPSB India would play a very important role once the new pension system would be established in the country. 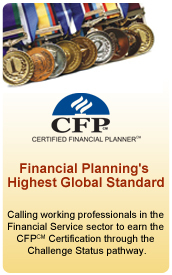 In October 2005 FPSB India organized the first Financial Planning Convention in India. FPSB India received an overwhelming response. There were over 800 delegates and 50 leading speakers from the Financial Services Industry from India as well as abroad. Mr. M Damodaran, Chairman, Securities & Exchange Board of India (SEBI) who kindly consented to our invitation referred the Financial Planning Convention as a ‘significant day’, given the positive effect that the FPSB India certification will bring about in India’s financial sector. He referred to the CERTIFIED FINANCIAL PLANNERCM professionals as one who would provide value, based on services that would be characterized by credibility and commitment. He said they would be playing a part in growing the nation, terming ‘standards’ as being all about ‘quality control’. Constantly updating skills would be a major aspect of such certification, he pointed out. Mr. Damodaran further added that it was a huge challenge to provide good, competent & honest advice. Post the Financial Planning Convention; FPSB India organized the FPSB’s Global Board of Directors Meeting and the FPSB Council Meeting, which had over 70 delegates participating from 22 countries to discuss the growth of Financial Planning Standards and CFPCM Certification globally.